No tricks here; it's all treats in the Hallohop Giveaway hop! This event is hosted by Savings in Seconds. 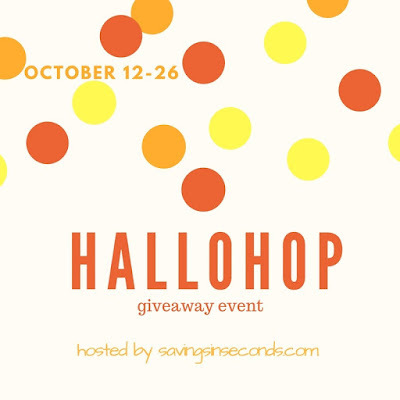 The participating bloggers have a ghoulishly good time in store for their readers, so enter all of the giveaways linked below! Halloween is here, and of course we all know that Halloween is all about the scares! I don't know about you, but I cannot think of anything scarier to a new mama than the teething baby! Dracula has nothing on the screams and cries that come with that, am I right!? Teething is definitely tough, both on babies AND their parents too. But it doesn't have to be. When it comes to easing teething pain naturally, I can never recommend Baltic Amber Teething necklaces enough. They truly saved us during Finley's teething days. Amber contains succinic acid which is a natural pain reliever and healing agent. When worn, the amber will warm and the succinic acid will be absorbed into the skin, resulting in a natural pain relieving effect. Sounds a little cooky, right? I'm not going to lie...it really does sound a bit crazy...BUT I'm telling you, it really worked! Finley started wearing her necklace at the very first signs of teething- just 3 months old! Right away we certainly noticed less drool, but we also noticed a change in her mood. And aside from a moment here or there, she really has handled teething quite well! But there are always many questions about teething necklaces: How long does baby wear it? Is it a choking hazard? What kind works best? Where do you buy them? These are a few of the many questions we've been asked, so I will try to address them as best as I can from OUR experience. How long can baby wear it? Finley wore hers 24/7. Personally, we co-sleep so Finley was always right next to me and never unsupervised. She had also been wearing it for so long that she never messed with it. Still, if you don't co-sleep or are just not comfortable leaving it around the neck overnight, you can also use it around the ankle under jammies. Honestly, we didn't even take it off at bath time! Is it a choking hazard? First of all, let's just be clear that these necklaces are made to be worn, not chewed on. Still, we all know that if it can reach their mouth, it WILL go in the mouth, right? For that, a proper fit is key. The necklace should be loose enough that it's not a choker (at minimum two adult fingers width), but not loose enough that it could reach baby's mouth. They are also designed with safety in mind. Each bead is individually knotted so that should the necklace break, only one bead comes loose. If caught on something, the clasp will also break apart, so as not to choke baby as well. I cannot and will not say that there is absolutely no risk, but when used properly and responsibly, the risk is very small. What kind works best? First and foremost, be sure that you are buying genuine amber...otherwise it's just going to look pretty. Aside from that, I have heard that raw is best and that the lighter the better...others will say it really doesn't matter. I went with the lightest color my store had to offer in raw beads, but if you prefer something else, get what you like! Where do you buy them? Personally we bought Finley's at our local natural parenting/cloth diaper store. If you have such a store in your area, I highly suggest checking there first. This will allow you to see the necklaces in person and try them on for sizing BEFORE buying. If that's not an option, you can find online as well. Again, just be sure to purchase from a trusted retailer as there are a lot of fakes out there! My granddaughter is teething at the moment and pretty miserable because of it. She could sure use this necklace. Thanks for the contest. My cousin would love this! Thanks for the giveaway! thank you so much! got a teething bebe i care for!